We're a dance and percussion group who love to bring the vibrant rhythms of Brazilian Samba to the streets and festivals of Nelson. We are always looking for more members, so check below for our next course, or send us an email through our Contacts page and we'll be in touch! We have some exciting events coming up over the Summer. Click on our Events page to see where we will be playing next! We are a community based percussion group, bringing the vibrant rhythms of Brazillian Samba and a selection of globals beats to the streets, festivals and wider communities of the Top of The South. We are the Nelson Sambassadors (previously known as Samba de Sol) and we have been part of the Nelson community performing at gigs and festivals in our region for the last eight years. We love to play and dance and we will be bringing our music to the Nelson streets this Summer! If you would like to join our band, or would like to book the band and/or dancers to perform at your event, simply enter your enquiry via our Contact page. We would love to hear from you! As a community group, we run regular intro courses for adults who are keen to play in the band or join our dancers. We also run our Fabtive program for kids to give them the opportunity to try drumming, stilt walking, dancing and other creative skills in term time and in the school holidays. If you are interested in learning more about Samba rhythms, keep an eye on our Courses page and join us on facebook www.facebook.com/nelsonsambassadors for the latest updates. Want to play drums or dance with us? Get in touch! Please get in touch if you would like to learn to play with us and have the opportunity to join us for festivals and events during the summer. 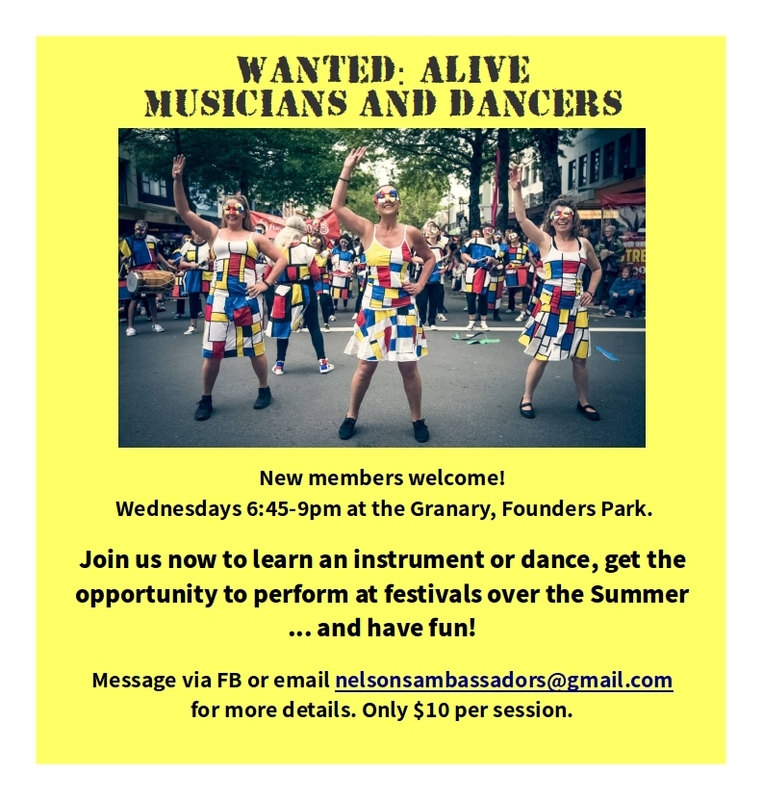 We practice at the Granary, Founders Park during term time on Wednesday Nights. We provide you with an instrument and lots of online resources to help you learn our pieces. Beginners and experienced players and dancers welcome, but a sense of rhythm and a commitment to regular rehearsals is required. The best time to join is at the begining of term, or via one of our intro courses, but If we don't currently have an upcoming intro course, you can still join via our Facebook page or our Contact Page and we will invite you along to one of our practice nights to have a go.